Just what’s happened to the weather in the UK this month? October is supposed to be cold, wet and miserable but instead we’ve been enjoying pleasantly mild temperatures and dry trails for the last few weeks. So with the woods riding so nicely, I’ll admit I had slight misgivings about heading up to the Lakes for a ride up and down a big rocky mountain that I’ve already ridden a couple of times before. I met my old pal Tony in the car park at Glenridding, arriving on the dot for once – having managed to get out the house without feeling that I needed a pre-emptive poo in advance of the 90 minute drive. We were joined by Mark and his mates Paul, Ian and a couple of other lads whose names I don’t recall. And that’s not because I’m an ill-mannered git, but because they shot off ahead on the long drag out up Keppel Cove and we only saw them again for a minute two hours later as they descended. Anyway, if you’ve not ridden up this way, be warned that it is steep from the outset, with a lung and leg-busting slog up the tarmac road before things ease off a bit on the bridleway climb. Of course it does steepen up again later on the zig-zags of Keppel Cove – which saw all of us off and pushing until the gradient slackened again as we got towards the saddle of the mountain. While the day was dry and only lightly overcast, we were greeted by a stiff wind at this point – which got stronger as we continued up toward the summit. I would normally have hoisted my bike onto my back for the steepest pitch but I was genuinely worried that it’d get blown out of my hands. Fortunately things had calmed down a lot by the time we’d stopped at the top for a bite and a chat – so we had the chance to enjoy that steep, loose and technical zig-zagged trail in more rideable conditions. I’d not come down this bit before so it was a bit of a treat – before we climbed up again to Raise and then descended to the top of Sticks Pass. Now I had ridden this before, so got pressed into leading off. Which didn’t turn out to be such a good idea. Getting carried away on the wide, bikepark-like swoopy trail at the top, I pumped and jumped one rise which was a bit like a tabletop – only to be find on landing that the trail turned a bit sharper than I’d realised and that it was off camber. Unable to keep my front wheel on track, I ploughed off sideways into a grassy ditch and came to an undignified halt – just in time to see Mark sailing through the air in my peripheral vision and Paul quickly following him, squealing with laughter. Fortunately we all ended up on the nice soft grass rather than any nasty, hard rocks – so we could enjoy the comedy of the situation. At least this had loosened us up for the descent of Sticks Pass which followed – and happily turned quickly from wide, flat trail to narrow, techy singletrack with awkward rocky sections and natural chicanes. 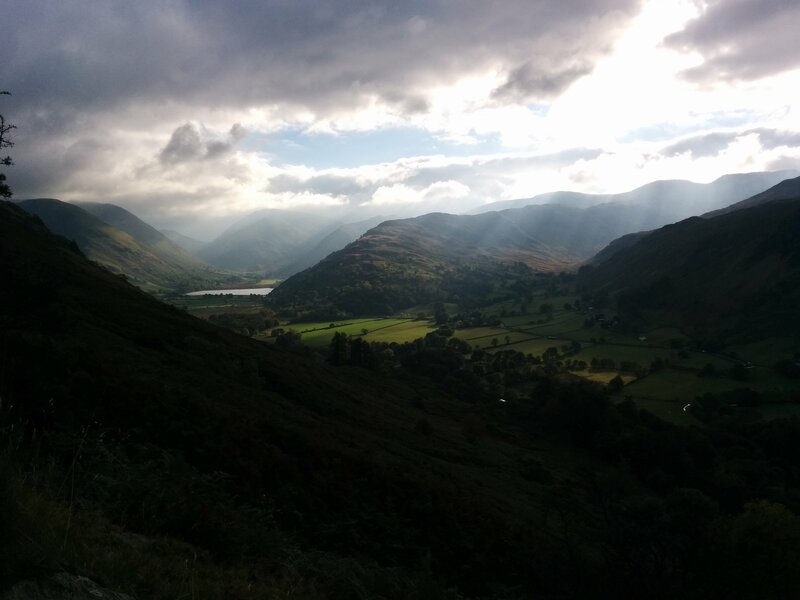 We were all thoroughly satisfied as we reached the quarry area towards the bottom – and took a moment for light refreshments before pushing onwards to another trail which was new to me – the Seldom Seen descent down to Ullswater. Now this is a footpath (albeit not a very busy one) and is quite popular with MTBers, and Tony had been telling us how you don’t meet many walkers on it. However the first man we came across – a man in his sixties who looked like a slightly younger version of Father Jack – was red-faced and shouting before we’d even got into hearing range (which added to the resemblance to be honest). 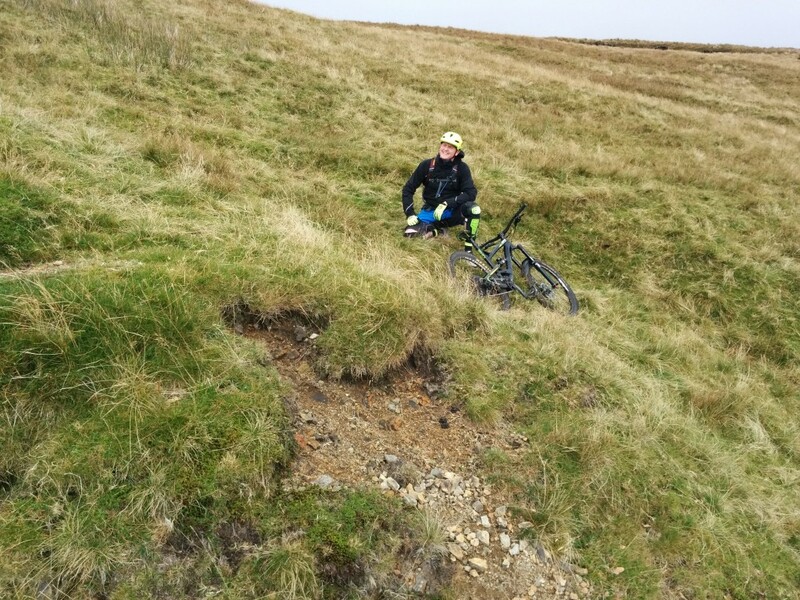 He was absolutely livid that we were riding on the FP and seemed to have some vague point about erosion, but wasn’t really prepared to consider the possibility that bikes don’t cause any more erosion than walkers. We were told a moment later by a walker that he was a local farmer who’d lost his dog, as well as his rag obviously. I wouldn’t have mentioned this, but I am writing about riding on a footpath – and I know even some MTBers frown upon that. It’s not something I will apologise for though. My opinion is that the best way for mountain bikers to prove that a Scottish-style law of responsible open access would work is for us to act as though we already have one. 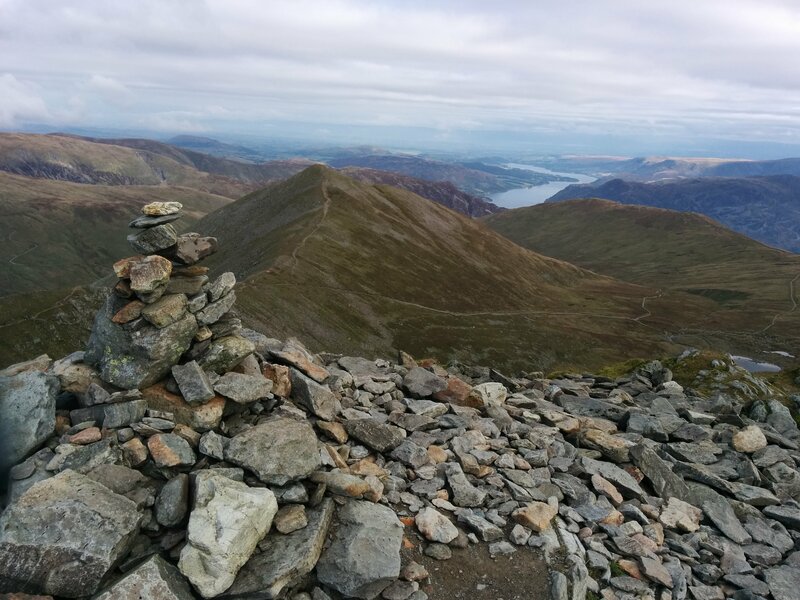 Anyway, sermon over – and we continued our ride down the steep-sided valley, with the going a bit slower and more nervy than Sticks Pass – as the trail was thinner now and there was a fair bit of exposure on our left-hand side. Not all of this was rideable on sight but it was great fun trying and once we’d got off the flank of the hill the trail got steeper and more grassy. Now I don’t know what they make the grass out of in the Lake District, or whether they feed the sheep on teflon, but the green stuff covering this particular hillside was remarkably slippy considering the bone dry conditions – as I found out when I attempted to pass Tony on the outside of a turn and quickly found myself on the floor. The same thing (me being on the floor) happened again barely a minute later as I braked sharply before a pile of rocks, and from then on I decided to rein in in a bit. 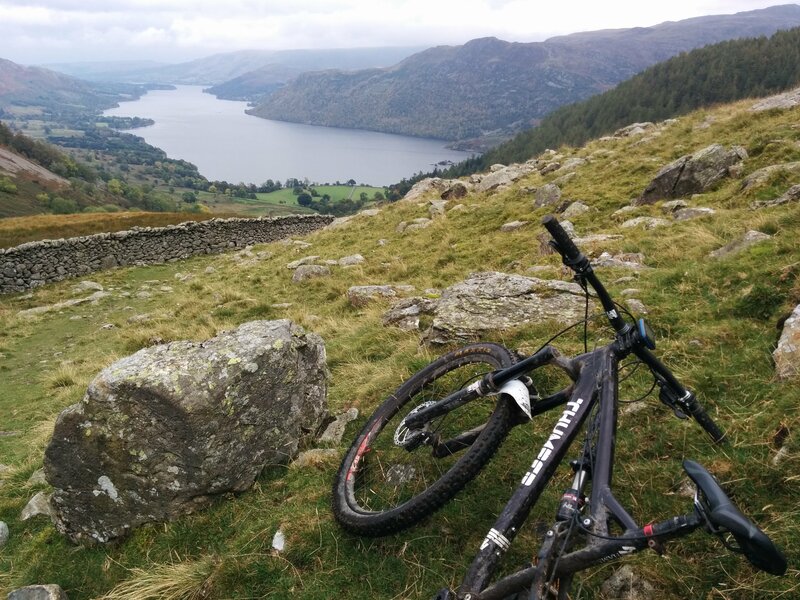 A bit more rocky, rutty fun and we took a cheeky right turn for a brief push up and a lovely twisty woodland descent down to the road beside Ullswater – with just a brief pedal back to the car park. 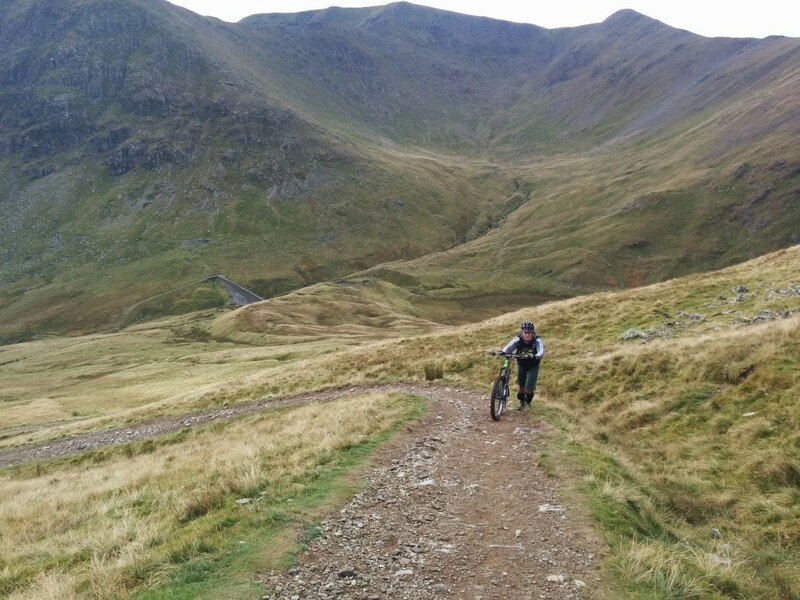 We’d had a decent half-day’s ride, but all (apart from Ian) still had enough energy for a bit more – so pedalled along the road to Boredale Hause, the long hill to the east of Helvellyn, where we knew there were a couple of cracking descents to add on. Things started well and I was pedaling happily up the first half of the climb, silently pleased with myself that my new 1×10 setup and expander cog were more than a match for the hill. A bit of stray fern jammed my cassette just as I neared the end of a flat bit though, killing my momentum and leaving me swearing and picking strands of vegetation out from between the cogs. It was probably just as well though, as the hill ticked up steeper than I remembered and we were breathing heavily despite just pushing our bikes up it. It’s a bit of a funny hill in that after the climb there are two parallel descents which skirt back down the same side of the hill (back towards Glenridding), barely 10 or 15 metres apart on the hillside. One is a bridleway and one a footpath apparently, though both are absolutely top-notch technical trails – fast, rocky, flowy but with some tricky bits we had to stop and have a look at. We rode the top trail together and Mark and Paul heard the call of the pub when we reached the bottom, leaving me and Tony to head back up the lower track. This gave us a chance to see what we’d be riding down – and even stop to try out a rock roll which looked a bit intimidating from below. The lower track turned out to be even better than the top one, more consistently technical but also more flowy – and I was delighted to ride the whole thing with no dabs. 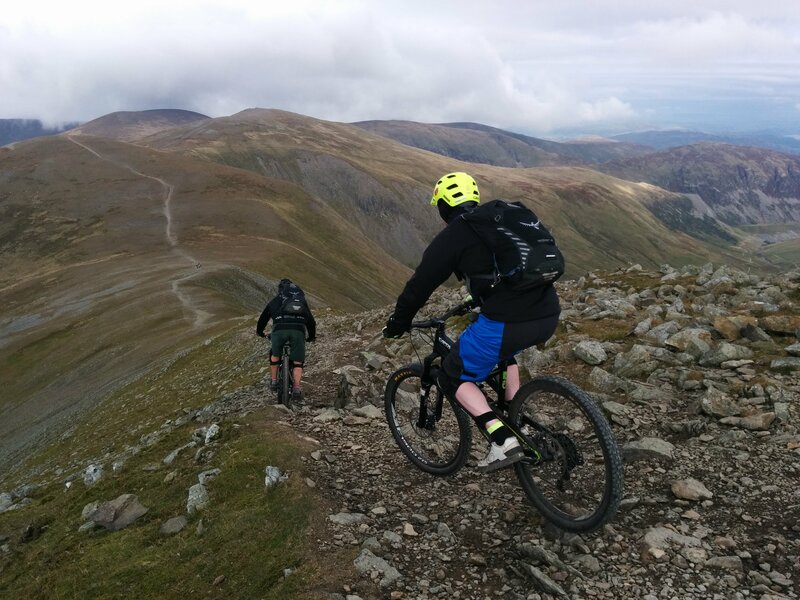 A brilliant way to cap off a great ride, who needs to be mucking about in the woods when you’ve got England’s highest (legally rideable) mountain to conquer, eh?